The exterior of our apartment. Beautiful lounge and dining room. 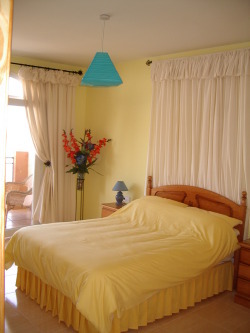 Owners on site to ensure your stay in El Cotillo is ideal. Transfers can be arranged for only 30 euros each way - payable locally. 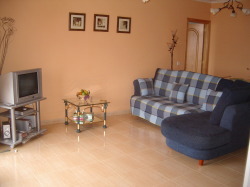 Our apartment is newly furnished to a high specification and is fully equipped. The lounge area is complete with widescreen T.V., DVD player and Hi Fi. Full size dining table complete with 4 chairs adorns the Dining area. French doors open onto the very large patio area, complete with cane suite and patio furniture - perfect for consuming a glass of wine prior to your evening meal. 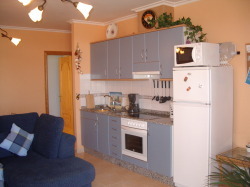 The fully fitted kitchen is complete with ceramic hob, full size oven, microwave, toaster, coffee filter machine, electric kettle etc etc. Double bedroom number 1 is one of the largest in the complex and has fully fitted wardrobes, bedside cabinets, chest of drawers - masses of storage space! A circulating fan is situated in the bedroom to keep you nice and cool on a hot summers night. French doors from this bedroom lead onto the balcony - complete with furniture - perfect for breakfast in the sun. Twin bedroom number 2 again is the largest second bedroom in the complex and comes complete with fitted wardrobes, bedside cabinets and a chest of drawers. The fully fitted bathroom is also very large and consists of bath complete with shower, bidet, full washbasin, and w.c. An automatic washing machine is situated in the bathroom to keep the sand out of your beach towels! On the top floor is a large private sun deck with patio furniture and 4 sunloungers complete with cushions. A shower has been installed in this area to make your sunbathing and relaxation much more comfortable. Balance to be paid - 8 weeks prior to tra to arrival.